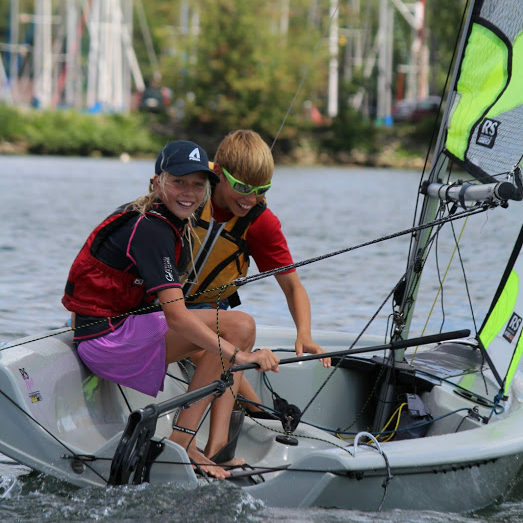 For youth aged 7 through 18, there’s no better way to spend the summer than at the ABYC junior sailing school program! 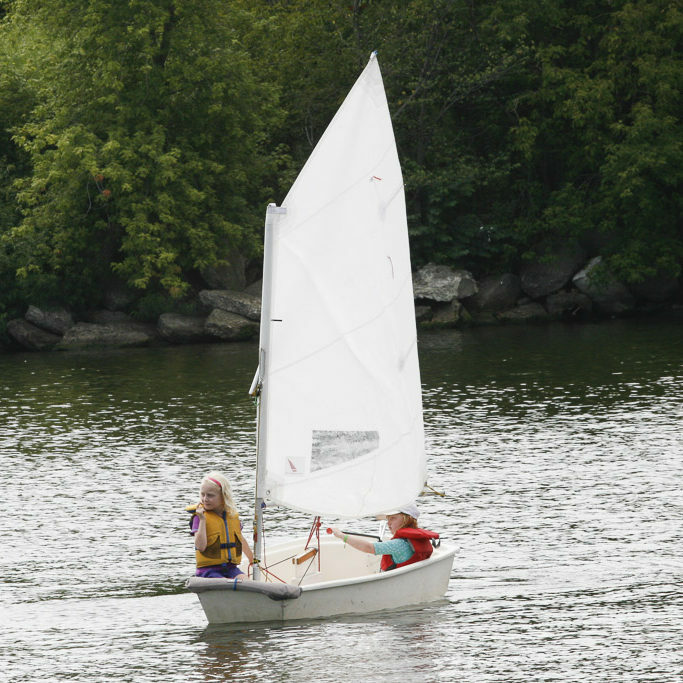 Participants in the learn-to-sail programs can spend the months of July and August having fun learning to sail and meeting new friends. In the more competitive Learn-To-Race stream training runs from May through October and athletes may participate in local, regional and international regattas. Participants in both streams work towards achieving their CANSail level certifications, the national standard. The following diagram depicts the progression of the Lean to Sail and the Racing programs. Our summer programs operate Monday through Friday, 9am to 4pm, and are split into 2, 4 or 8 week sessions according to level. Early drop off is from 8:30 am on and we can provide aftercare until 6 pm by arrangement for an additional fee. 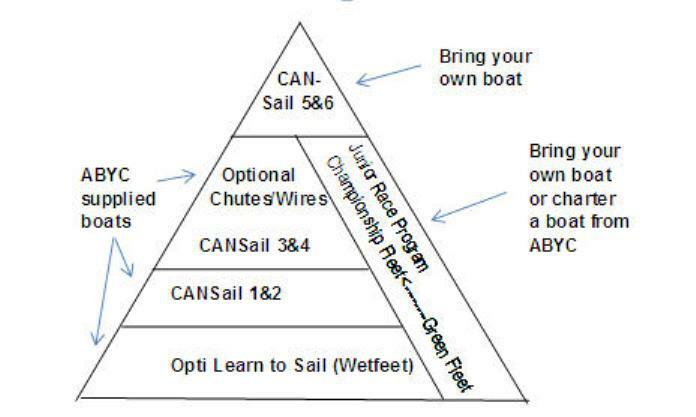 Take a look at where your sailor fits into the CANSail system! This is an introduction to sailing for the young child with no previous experience. 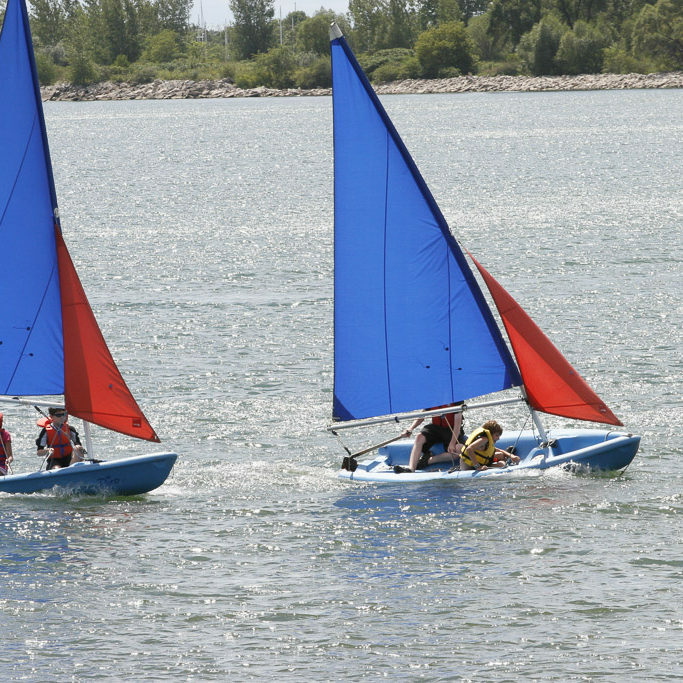 In stable, sturdy Optimist dinghies (designed specifically for beginners), sailors learn basic steering and sail control skills in a small-group environment. Off the water, instructors teach the points of sail, boat parts, and weather and safety information through games and interactive lessons. Highlights of this program include surprise theme days and excursions to the beach. This program emphasizes safety, fun, and learning, and provides ideal preparation for the CANSail 1 & 2. 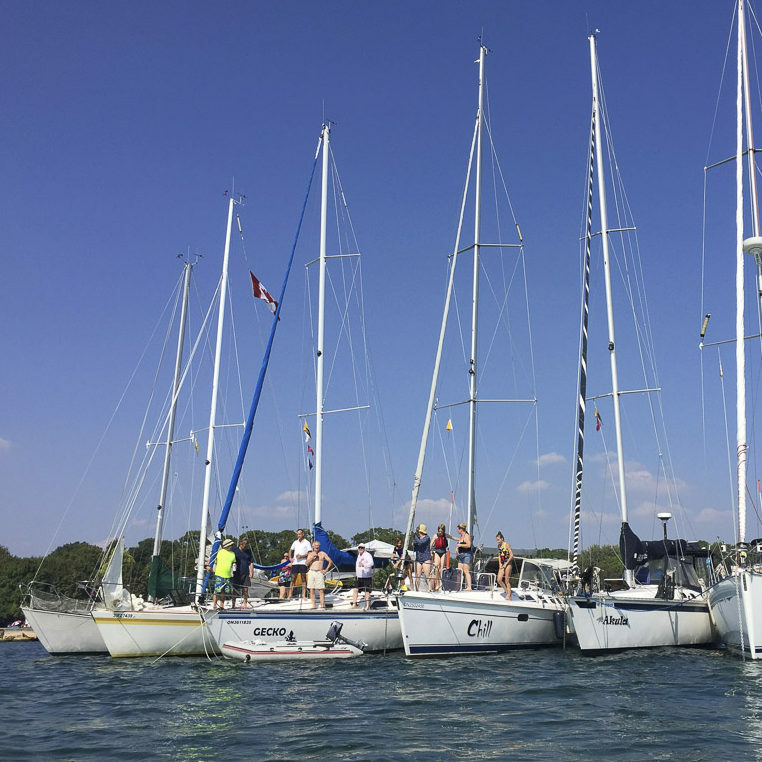 For young sailors interested in learning how to race, this program offers an excellent opportunity to practice in a small group with a dedicated racing coach. No previous racing experience is required however students should enjoy time on the water and have a growing interest in the sport. Students are taught in racing Optimists, the international youth racing standard. They can either sail in their own boat, as Junior Memberships are provided with summer enrolment, or in racing Optimists available for charter from the club. Throughout the year participants have the opportunity to participate in a minimum of 3 regattas at local, regional and international levels, depending on their personal objectives. Training programs are offered from May to October in spring, summer and fall sessions, which participants may opt in and out of depending on their training objectives. Beginner racers have their own dedicated coach and can focus on skill acquisition while they begin to learn about racing. They will be competing in the Green (beginner) Fleet while at regattas, where ample on-water coaching and support is provided. They have the ability to work on achieving CANSail levels during the program’s duration. Experienced racers have the opportunity to work with a dedicated coach on advanced skills and tactics in our Championship Fleet. This program is meant for sailors who have completed their Green beginner training in an Opti Race Program and are ready to compete at the Championship Fleet level. Again, sailors will be able to work on achieving CANSail levels during the program. 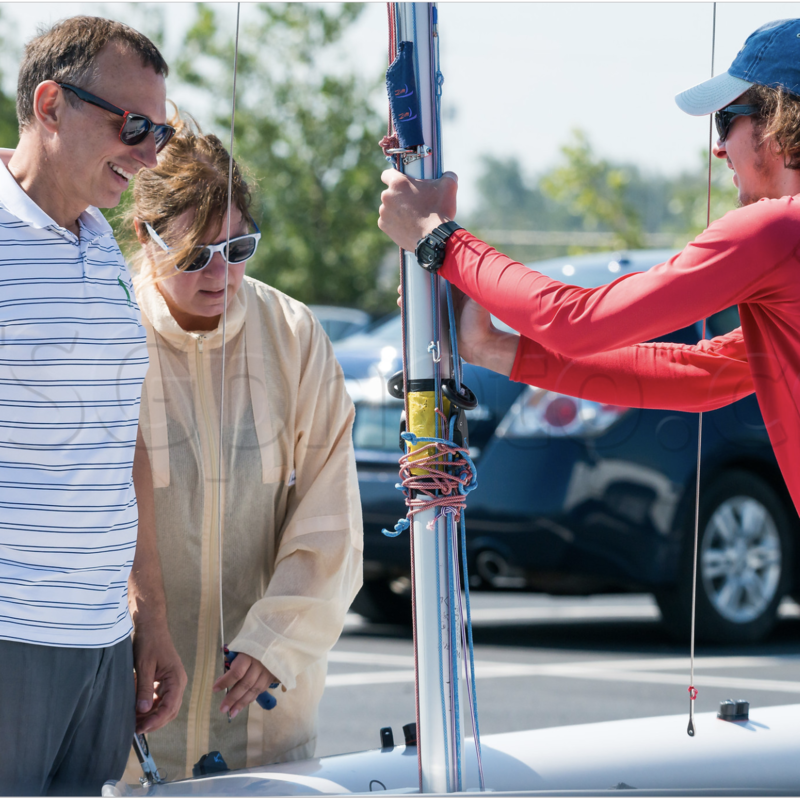 This program requires a minimum of 3 weekends of travel and demands a moderate commitment from both sailors and their parents, who will be asked to chaperone at regattas and/or help provide transportation to races. In addition, regatta fees and travel expenses (transportation, lodging and food) are not covered in the program fee. This is a basic sailing course for new sailors or those with limited sailing experience. Sailors are introduced to the sport and learn the fundamentals while sailing in 420s and RS Fevas. The course covers the basic elements of sailing theory (parts of the boat, points of sail) and on-water skills in safety, crewing, steering and seamanship. Sailors also learn basic physical literacy through fun activities and sailing games. 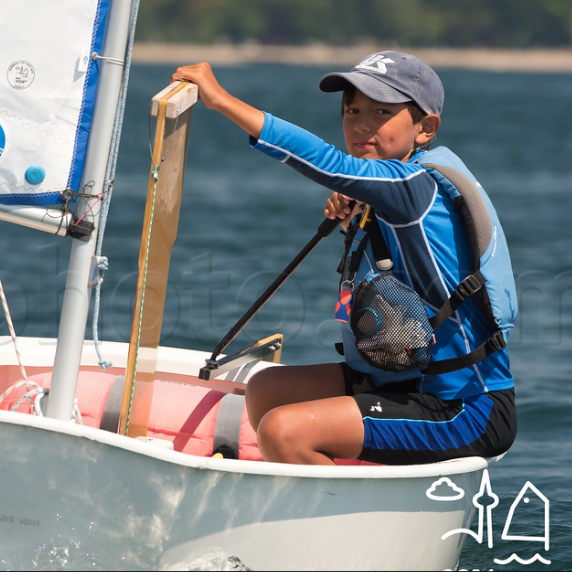 As in the Optimist Program, the emphasis is on safety, fun and teaching youth sailors to confidently handle a small dinghy. Note: Participants in this program learn the vital Sail Canada safety skill of righting a capsized sailboat, so be prepared to get wet!! In double-handed 420s, sailors build on existing skills in all types of conditions and to a higher level of proficiency. Sailors are introduced to concepts such as right of way, reading wind and waves, proper use of sail controls and tactical mark roundings. Highlights of the program include a trip to a Toronto area regatta. CANSail 4 participants are introduced to double-handed skills such as spinnaker and trapeze. This program emphasizes high-performance sailing and basic racing and acts as a foundation for the Racing Team. Because of the more advanced nature of this program, a four-week commitment is required, wth double handed race team members having the option of an additional 2 week session in August to attend an out of town regatta. The focus in CANSail 5 & 6 is on integrating higher-level boat handling skills in on-water drills and on-shore coaching sessions. Participants supply their own boats. Centered on the training camp atmosphere, sailors will refine advanced sailing skills and learn racing rules, tactics, strategy and regatta preparation. 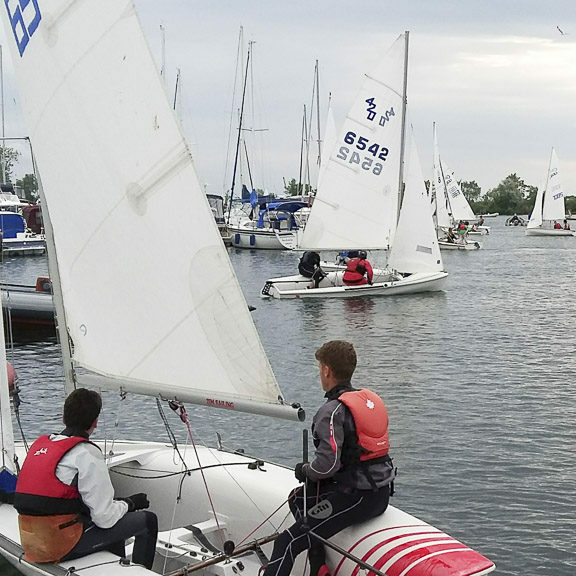 Sailing in Laser Radials, Race Team members spend the summer competing at various regattas throughout Ontario under the guidance of a Sail Canada certified Race Coach. Away from the club, Race Team members meet and compete with sailors at local, regional or international regattas. Training programs are offered from May to October in spring, summer and fall sessions, which participants may opt in and out of depending on their training objectives. Note: This program requires 4 to 6 weekends of travel and demands a high level of commitment from both sailors and their parents, who will be asked to chaperone at regattas and/or help provide transportation to races. In addition, regatta fees and travel expenses (transportation, lodging, and food) are not covered in the program fee. Ensure your child’s spot this summer! There’s no better way to show your kids how to have fun out on the water than to sign up for our adult dinghy program yourself! Get out on the same boats your kids are on and show them how it’s done. Warning: Your kids may want to race you. 2. Be able to swim 20 meters unaided. 3. Bring own properly fitting Department of Transportation approved life jacket. Lifejackets can be purchased at any local boating supply store or outdoor sporting goods store (eg. Mountain Equipment Co-op, Canadian Tire). Start Keelboat Sailing, Basic Crew or Basic Cruising Standard. Students may register for one or both weeks. Student will be provided with Sail Canada Basic Cruising text (all theory will have been covered in class), on-the-water testing, and written exams. Additional fee for materials and certificate costs: $130 + HST to be paid in advance. See form for details. We are now accepting registration – spaces are limited! There’s no better way to show your kids how to have fun out on the water than to sign up for our adult keelboat program! Get out on the lake and show them how it’s done. Warning: Your kids may want to join you for family sails.